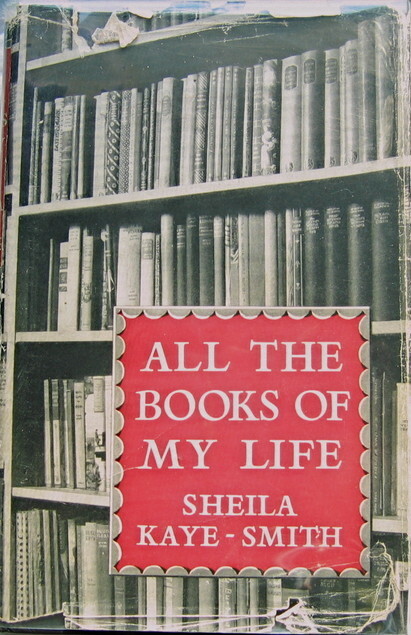 When I finished reading All the Books of My Life by Sheila Kaye-Smith, I was almost giddy with delight. A memoir focused on Kaye-Smith’s reading throughout her life, I was enchanted by it to the point that when I finished I told Simon (who read it last year and adored it) that “if I wrote the review right now it would be so gushingly, adoringly positive that only people who have read and loved the book already will be able to make sense of my ramblings.” So, for your benefit dear readers, I have waited. Let us see if I am any more coherent now. I do not want to exaggerate the effects of reading on character, but the influence of a book is probably as strong as any to be gained from most human contacts. After all, a book is the voice of a fellow creature, calling through the print, perhaps from somewhere close at hand among our own interests and occupations, perhaps from across the world, perhaps from across the ages. It is one of the many forms taken by experience, and through reading it we may find ourselves transported into an entirely new field of perception. Even if we do not choose to remain there we probably shall not leave it as if we had never entered it. My failure ever to read Little Women must be put down to more humbling causes. I found the March family much too good for me. I liked children to be naughty – to ‘get into scrapes’ as we called it then – so that I need not inevitably feel inferior to those I read about. The unselfishness of the Marches in giving their breakfast to feed the poor, and sacrificing their Christmas presents to help the Union Army was more than I could bear. They had performed actions of which I was incapable and I hated them for it. I never got beyond Jo’s sacrifice of her hair. For all the recognizable titles she mentions, there are just as many obscure ones by authors long forgotten. There is an entire chapter, “Sad Pageant of Forgotten Writers”, devoted to them but the second-rate reading material of her youth belongs there too. Kaye-Smith is very sensible about it all, being not particularly sentimental about childhood favourites and recognizing that the bulk of the reading material from her Victorian and Edwardian childhood was poorly written and not worth preserving. I am not sure I’ll ever want to read Kaye-Smith’s novels – like Simon, I am afraid they are just the kind of rural novels that Stella Gibbons had such fun skewering in Cold Comfort Farm, though I do already have Joanna Godden sitting on my bookshelf – but I loved reading this. It is such a fun, appealing format for a memoir and Kaye-Smith carries it off beautifully; the balance between her life and her reading is just perfect and the writing is beautiful and humourous. I thought it would be a difficult book to top…but then I read Speaking of Jane Austen (aka Talking of Jane Austen) and that was even better. Thanks to Sheila Kaye-Smith, my reading for the year is off to a very good start! They are! I really think you would enjoy this Audrey, I know you would love the book on Austen! You’ve introduced me to another “must-read” book – I love reading about other people’s reading, past and present. I’m trying to think of how to describe this kind of book, literary autobiography doesn’t sound quite right. I am never quite sure how to label these books either but I love them regardless! Sounds wonderful – I love reading about other people’s reading lives. So do I! I think I probably still love Howards End is on the Landing a little more than this, if I am forced to rank my favourite reading memoirs, but the writing here is superb and the entire book is a delight. I, too, loved this book; in fact, I use a quote from it as the description under the title of my blog! I haven’t yet read her two volumes on Austen, but have them both and very much look forward to reading them, being spurred on by Simon’s and your comments! Have you read Elizabeth Jenkins’ biography of Jane Austen? I loved it, and think it will be interesting to compare it to Kaye-Smith. Thank you for your enthusiasm and your wonderful review! You’re going to love the Austen books! I haven’t read Jenkins’ biography of Austen yet. My interest is less in her life than in other readers’ responses to her work, which is why the Kaye-Smith/Stern book was so wonderful for me! What a lovely review, Claire – it feels like reading the book all over again! And also reassures me that the book WAS as wonderful as I remember it being. I couldn’t quite believe that it had been. It was that wonderful! Thank you for bringing my attention to it; without your championing of it last year it would have passed me by completely. What a shame that would have been! Thanks for the review! This book sounds like it would be a very interesting read. So unique. Plus, who doesn’t love hearing about what others read and how it affected them. Exactly! What reader doesn’t love reading about other readers? The books might be different but we can all relate to the transformative power of reading! I’ve seen other gushing reviews about this one and it spiked my curiosity. I’ve come to realize much more about how certain books marked stages in my life now that I’m re-reading books I loved 15 or more years ago. Does Kaye-Smith talk about re-reading? She does talk about rereading, though not in depth. There are certain books – like Austen – that she reads over and over for forty years but mostly she talks about the kind of books she was reading a certain points in her life. She doesn’t focus on specific books all that much though when she does it is a delight. Looks like it’s an interesting book, I put it on my “books to read” list!